Sunday evening I picked up my 6 month old baby Greenwing, Riley, from the airport. I never met him before picking him up at the airport, and understand he needs time to adjust. I was just wanting some tips on helping him settle into the house. He isn't DNA tested, just calling him/her a him for easier reference. He enjoys being in his cage, playing with his toys and eating. He also comes up to the cage bars to let us pet his beak, and nibble on our fingers. But he does not want us to scritch him at all. He also is very hesitant to interact with us with the cage door open. He seems to have a lot of pin feathers I'd like to help him with, but I cant since he is still unsure of us. I would hate to scare him more by trying to mist him. I'm assuming he just needs more time to settle in and feel secure here, which is fine with me I can wait. Is there anything I can do to help him with this? Right now I sit with him in his room by his cage and talk to him,spend time with him, and eat with him. 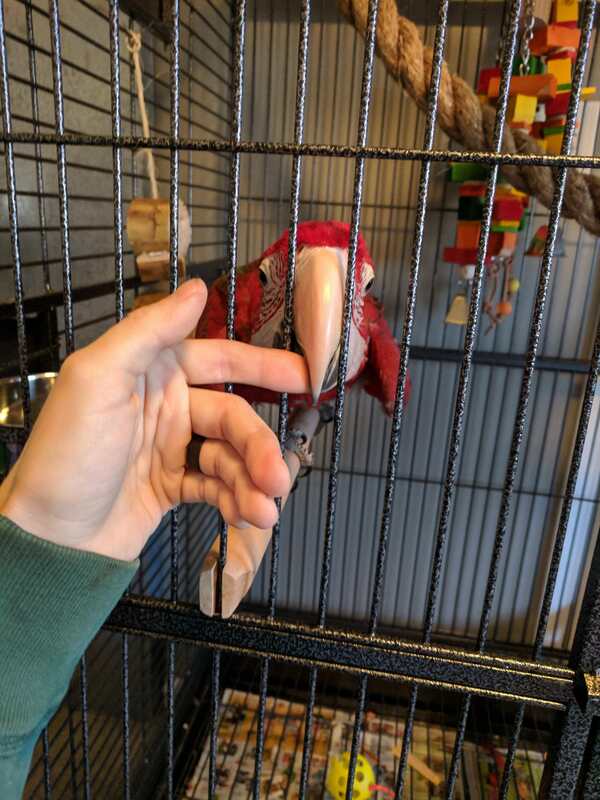 I play with his beak when he comes up to interact with me. I don't reach into his cage and force interaction with him because I don't want to scare him. 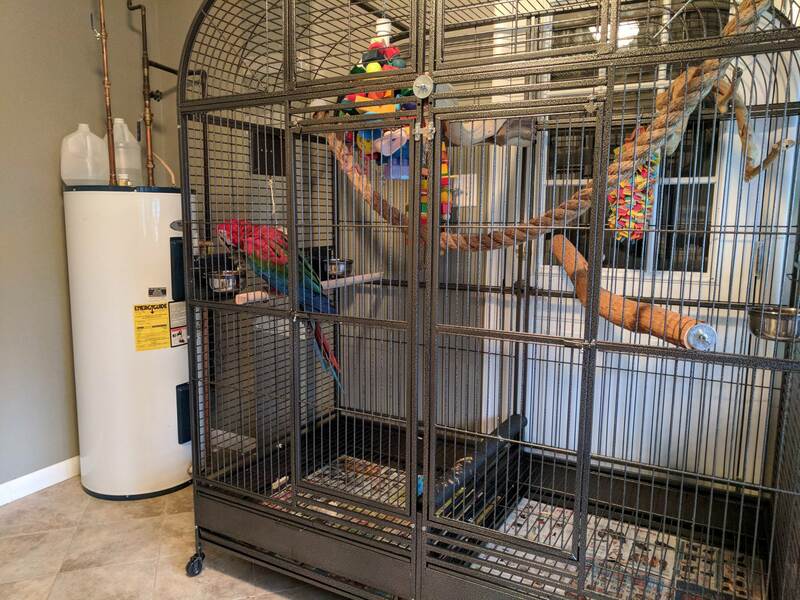 If I let him out of the cage it's very difficult to get him back in, as he is scared of interaction out of the cage, he is not scared of the cage. He is a sweet baby and gentle when he plays with his beak, until he gets too excited LOL. Any help would be appreciated. I just want to help him in anyway I can. Last edited by Dibaltic; 12-14-2017 at 01:14 PM. First of all, congratulations on your new baby, and welcome home to Riley!! Understand that during this time Riley will (as you mentioned) simply need some time to settle in. Also realize that it will be a process, as you were never able to meet him before bringing him home, you are starting to develop your trust bond and again, patience is key here. When you sit with him, try offering him different treats when he approaches the edge of the cage to be near you. This will establish if Riley is food-driven, which will be great for training him later, down the road when your trust bond Iis more solidified. Once Riley begins accepting treats from you and no longer fears you opening his cage, then that is when you can begin training to step-up on command. The nibbling is a good thing, of course when he gets riled up you want to try to prevent any hard biting by giving him toys and things to chew. It is all a process, it will take time and patience from you, but it will be very rewarding for both you and Riley in the long run to set down a solid foundation of trust right now by letting him come to you on his own terms. itzjbean pretty much hit the nail on the head. Your pictures alone show you have done your homework. Kalani came home the same way. Took a plane from California and we were strangers. I can say with confidence, progress will happen quickly. Macaws crave attention, and he is a baby nonetheless. Sitting by the cage and reading or talking to him for long periods of time will reinforce you aren't a threat. Treats by hand will reinforce you are a positive entity. If he's taking treats from you, start at least making him reach over your opposite hand to get the treat. Work your way up to consistent "step-ups." Agree with all the above posts. Looks like you did your homework, nice sized condo, good fruits and veggies, play stand. Yes, read to your baby. You'll be surprised how much of a difference that can make. We've been reading to Arika and she enjoys the vocal stimulation and the attention. Since it's Christmas time, we've been reading the Christmas Poem to her and when we really put some emphasis into the story she gets even more excited. Cas27 told us a few months ago... "Don't forget too talk to her, a lot of blues are very vocal you will be rewarded". I'm sure that holds true to most of our feathered friends. We never forgot what he said, have followed through, and have been rewarded. Enjoy your new baby and keep your eyes on the forum. There are many experienced, knowledgeable, and kind people here willing to help. Thank you! I will have to keep trying different foods to see what his favorite treats might be. So far he seems to really respond to Harrison's Birdie Bread. Will have to find some more things he likes that are a little easier to give as training treats that he still enjoys. I will continue to give him time, and being patient with him. He will reach across my hand or arm no problem to get a treat. I will just have to keep at it and be patient like you said. I want to establish a good solid foundation the right way. And you're right about the craving attention. He definitely gets excited when we go into his room in the morning to sit with him! I will definitely start reading to him! Thats a good suggestion, will make talking with him even easier. I will be keeping my eyes on the forum, lots of good information on here. Welcome and be welcomed. Congrats on your new baby ! 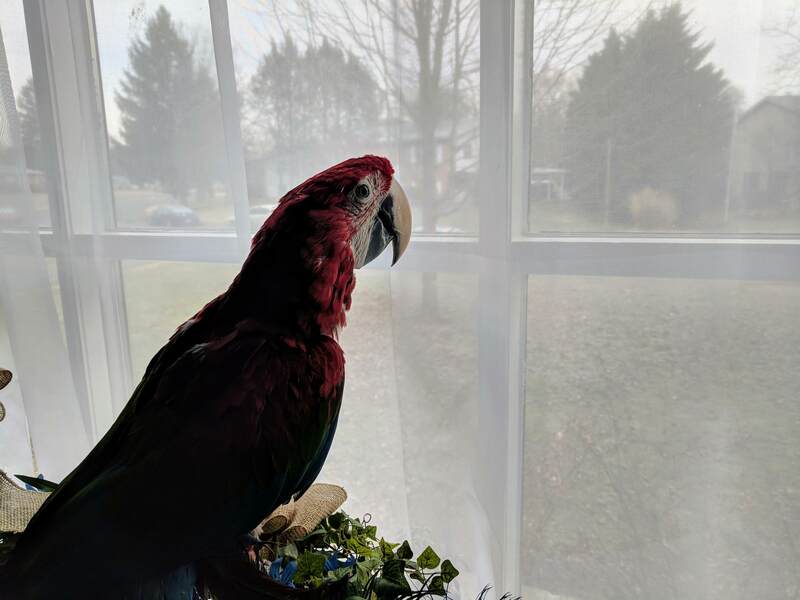 If you haven't already, go to the macaw sub forum, and read, aloud to Riley, all the stickys at the top, and especially all the posts from Birdman666, our Macaw guru here on ParrotForums. It is a lot of reading, but you and Riley will benefit greatly. Matter of fact read them a few times, its that usefull. Also, in the Amazon sub forum, stickys written by Sailboats. Most of his posts are applicable to all parrots. While Riley settles in, try and figure out what his favorite treat is, that is going to be one of, if not the, best ways of giving Riley positive reinforcement. Remember - negative re-enforcement does not work with parrots, not at all - it may even have the exact opposite effect. We have a saying here, totally the best thing to keep in mind when living with Riley - "It's never the fault of the parrot. It is ALWAYS the fault of the human". Good luck and keep on participating here - this is a really loving group of humanity. 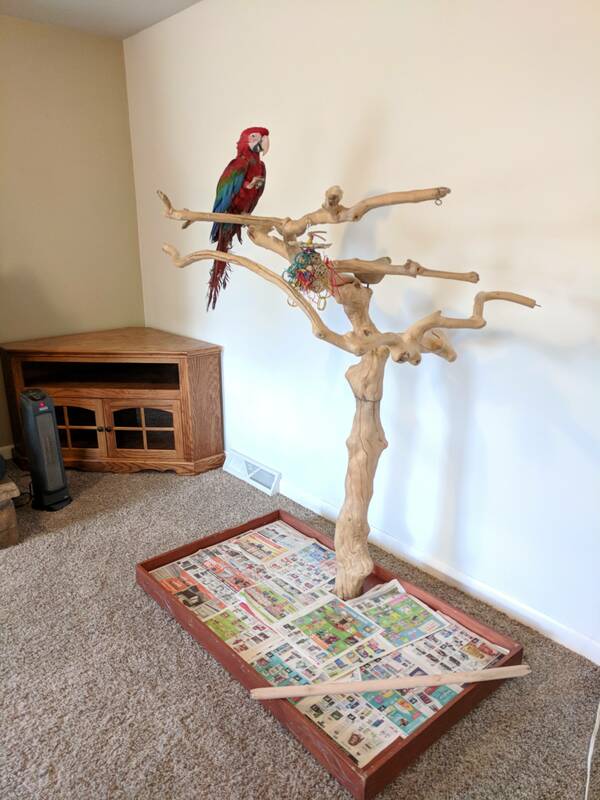 you've done a lot better than I would be able to do with a new Macaw! This tells me the breeder didn't do the basics on handling or socialization. This bird probably wasn't handled much, except for feeding times. With macaws, it's all about handling, attention and interaction. The more interaction time they get, the more they want. A few hours of lap time, playing games, and getting head scratches and treats is usually all it takes to get them looking forward to it. You've just got to get them to do it the first few times... after that you're golden. Birdman, he is flighted, so how would you suggest the best way to get that first few lap sessions in? What's the best way I should go about it? Yes, we were feeling that he wasn't handled or socialized. 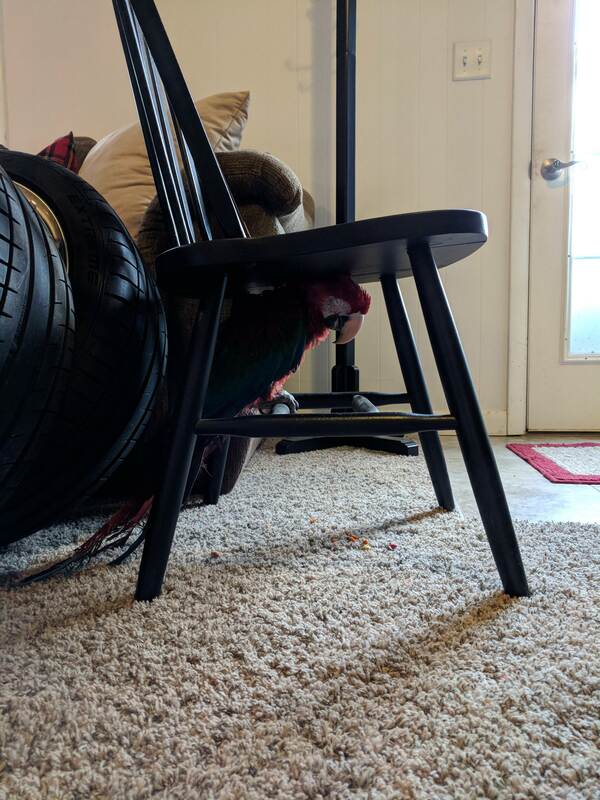 So far its been a week and finally today we were able to give a few scritches once he flew out of his cage. At first he was afraid of the contact, but then he fluffed up and enjoyed it. He plays very well with his toys, but if we aren't in the room you can see him hanging from the sides trying to see us. And he gets very excited when we come into the room. 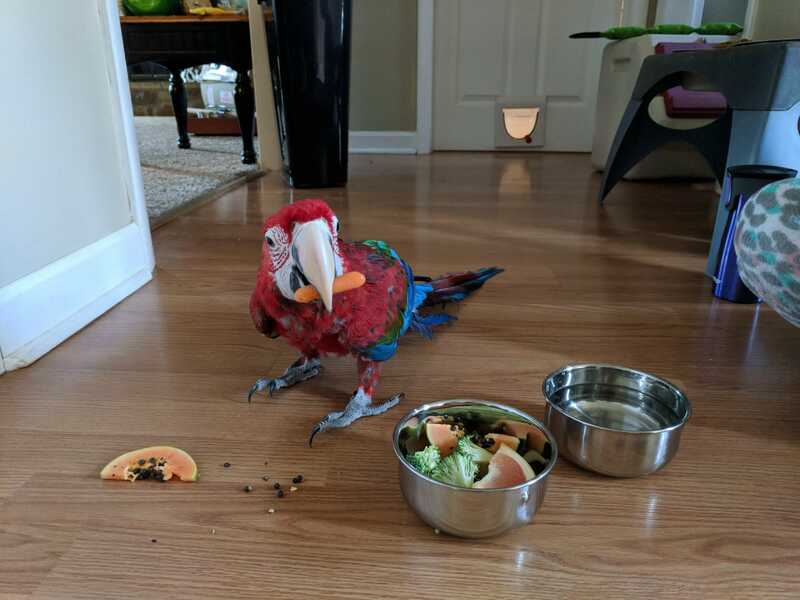 We spend several hours a day in his room, talking, giving treats when he comes near and lets us pet his beak, read to him, and make a big deal about things he is doing. We have discovered he loves pine nuts, since that we have made a lot of progress. Today he has started hold my arm with his one foot and nearly stepping up, rather than running away once he gets a treat. The more time we spend with him the better he has gotten, of course. But just seems that he wasn't socialized the way we were told that he was. Sounds like you all are doing great. Happy to hear things are moving right along.